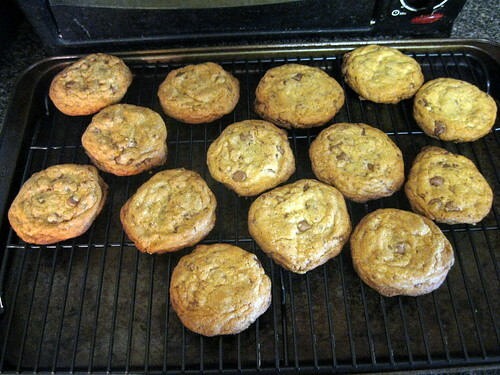 Toffee Chocolate Chip Cookies | Hapa...Shot the Food! I’ve been sequestered in my apartment for the past week, mostly catching up on projects at home and episodes of Man v. Food (the only episodes I have not seen now are the clip-based episodes, as they are not included with the DVDs). And of course, it’s about time I caught up with this blog. 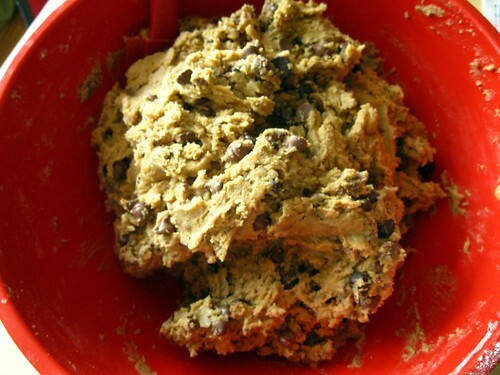 This blog started with a cookie recipe… might as well restart it with one. Most who know me know quite well that I’m an unrepentant chocoholic. I’m also a fan of toffee. When combined, they make a very happy hapa. The next two posts are going to feature desserts that combine the two. 1 cup dark brown sugar (Hapa note: The cookie will be equally yummy with light. Use what you have). Directions and (almost) step-by-step shots under the jump (Shots spliced from two different baking sessions). 1) Preheat oven to 375 degrees. 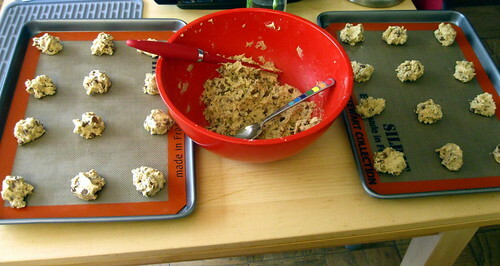 Prepare baking sheet with parchment paper (I now have Silpats serving that purpose). 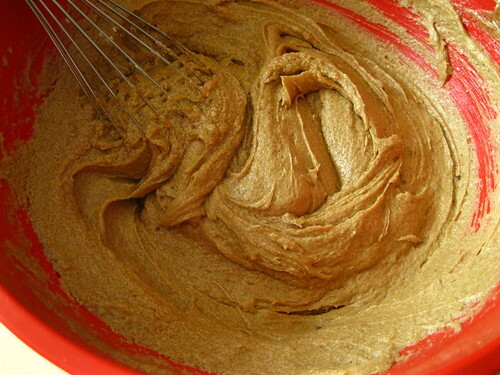 2) Place sugar, dark brown sugar, butter, eggs and vanilla in a bowl and whisk together until smooth. 3) Add baking soda, salt and flour to the sugar mixture and whisk together until smooth. 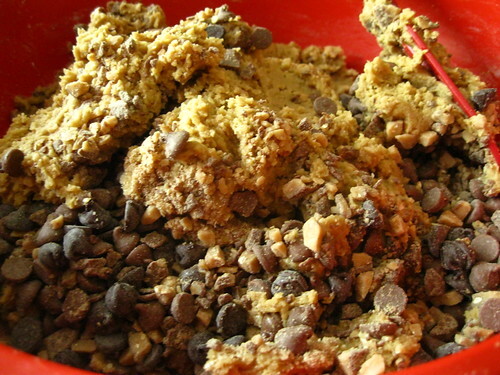 4) Fold in chocolate chips and Heath Bar bits. 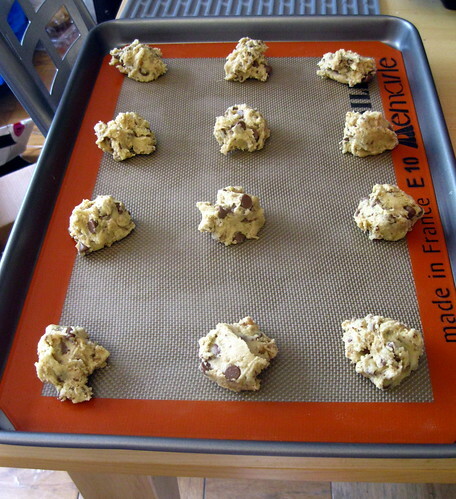 5) Drop rounded tablespoonfuls (or use an ice cream scooper) onto baking sheet approximately 2 inches apart. 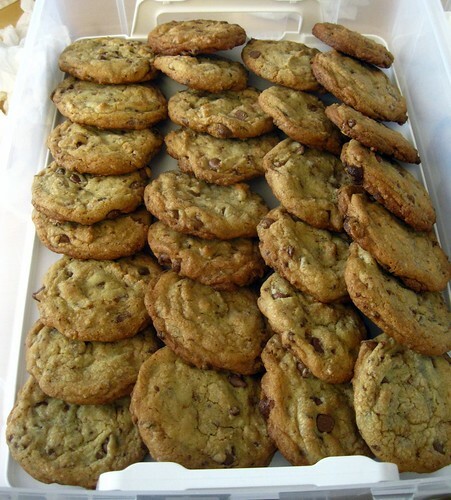 6) Bake for 10-12 minutes, remove from the oven and allow to cool on baking sheet for 1-2 minutes and then transfer to a wire rack to cool completely. 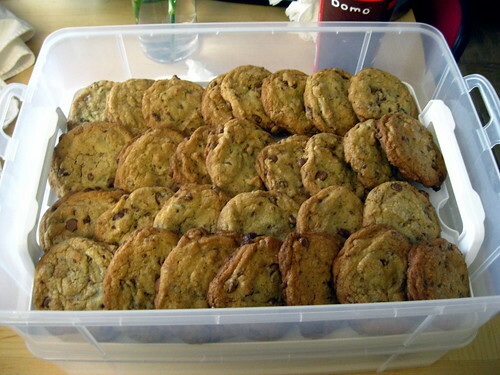 Posted on June 24, 2012, in desserts, recipes, Uncategorized and tagged chocolate chips, cookies, toffee. Bookmark the permalink. 2 Comments.